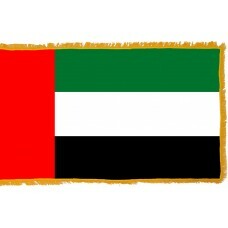 The United Arab Emirates flag features three horizontal bands in the colors of green, white, and blue and on the left-hand side of the flag is a red vertical band. 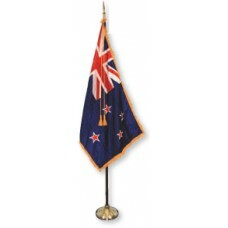 The colors used on the flag are the Pan-Arab colors to represent the unity of the Arab countries. The green color represents the fertility of the country, the white color represents its neutrality, the black color represents the large amount of oil that the country has, and the red color represents the strong commitment to Islam and the Prophet Mohammed. The United Arab Emirates flag was designed by Abdulla Mohammed (who, at the time was 19) after a competition was held in the newspaper. One thousand and thirty designs were received until the current one was chosen. 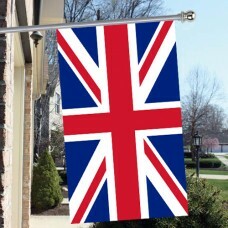 The design of the flag was inspired by a poem that stated, "our acts as white, plains as green, battles as dark and swords as red." 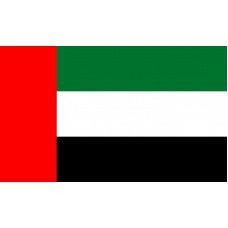 The United Arab Emirates flag was adopted on December 2nd, 1971. The United Arab Emirates (also referred to as Emirates or UAE) is a country located in the Middle East that consists of seven emirates (state or province) which are, Abu Dhabi, Ajman, Dubai, Fujairah, Ras al-Khaimah, Sharjah, and Umm al-Quwain. It shares borders with Oman, Saudi Arabia, and maritime borders with Qatar and Iran. The capital and second most populated emirate is Abu Dhabi and the most populated emirate is Dubai. Each emirate has its own ruler who is also known as an "emir." The United Arab Emirates has a very large economy with high-income. The economy in most of the emirates is reliant on oil. It is also very reliant on tourism, with Dubai being the most popular tourist destination in the Middle East. Dubai is home to many famous landmarks such as the "Burj Khalifa" which is the tallest man-made building in the world. It also has the most floors in the world, the highest restaurant and nightclub in the world, and the world’s longest elevator. The Dubai Mall is another popular attraction and, by area it is the largest mall in the world as well as the most visited building in the world and attracts approximately 80 million tourists a year. The Emirate of Fujairah is home to the "Al-Bidyah Mosque" which is thought to be one of The United Arab Emirates most important historical sites. A major attraction located in the capital of Abu Dhabi is the "Sheikh Zayed Grand Mosque" which is considered to be the most beautiful mosque as its made mainly from marble and features enormous crystal chandeliers, colorful stones embedded on the walls and floors, and has the largest hand-knotted carpet in the world. As well as the mosque, Abu Dhabi is also home to the "Emirates Palace" which was the world's most expensive hotel to build and is a huge a tourist attraction.